Britain's May seeks to sell new Brexit delay at home - SABC News - Breaking news, special reports, world, business, sport coverage of all South African current events. Africa's news leader. Activists wave EU flags near the Houses of Parliament in central London. British Prime Minister Theresa May will try to convince her splintered country Thursday to accept a Brexit delay of up to six months she secured from EU leaders to the fury of many in her own party. May’s 27 EU counterparts pulled another all-nighter in Brussels before clinching a compromise timetable for the unwinding of nearly half a century of ties that have been guiding many of Britain’s policies. Britain will be able to leave before October 31 if its parliament manages to finally ratify the ill-loved deal May reached with the bloc and that has been behind all the political drama and anguish in London. 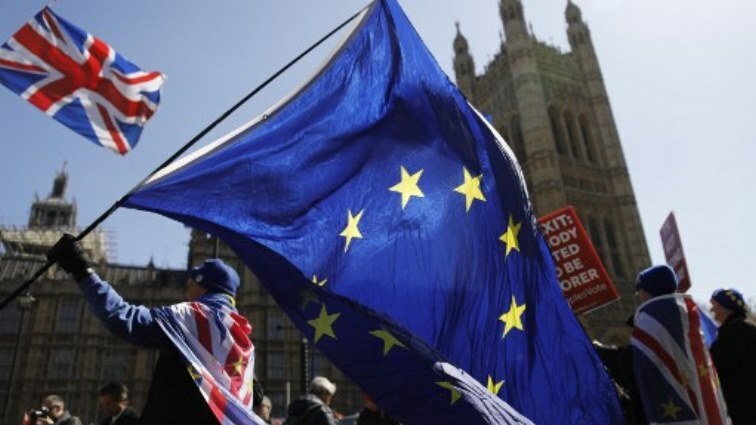 It could also still crash out on June 1 if it refuses to take part in European Parliament elections on May 23 — three years after Britons narrowly voted to leave in a referendum whose arguments echo to this day. May will instead try to use the delay threat to secure votes from Brexit-backing lawmakers who keep voting against her because they view Britain’s current withdrawal terms as an abdication to Brussels. “The EU have agreed that the extension can be terminated when the Withdrawal Agreement has been ratified,” May said. The pound rose slightly in relief that the sides had managed to avoid a messy divorce that would have loomed had the current Brexit extension expired on Friday night without a new delay. The delay avoids a possibly economic calamity on both sides of the Channel but does little to resolve the political morass that has seen May’s control over her Conservative Party and cabinet gradually slip. Top anti-EU Conservatives lined up to take shots at their party leader while her Northern Irish coalition partners prepared for meetings in Brussels at which they could air their grievances with the plan. “The pressure on her to go will increase dramatically, I suspect, now,” May’s former Brexit secretary David Davis told the BBC. Right-wing MP Jacob Rees-Mogg also recalled May’s promise to lawmakers on March 20 that she was “not prepared to delay Brexit past June 30”. “I thought the prime minister said a few weeks ago that she wouldn’t agree to any extension and now we are getting quite a long one,” Rees-Mogg said. The party’s right wing fears that this delay might be prolonged yet again — and the extra time used to either water down the split between Britain and Europe even further or annul it outright. EU Council Donald Tusk admitted in Brussels after the marathon meetings wound down that “everything is possible”. “Our intention is to finalise the whole process in October… but I am too old to exclude another scenario,” Tusk told reporters. May did get an unexpected boost in the shape of a tweet from US President Donald Trump — a leader whose protectionist agenda has him locking horns with Brussels over trade. “Too bad that the European Union is being so tough on the United Kingdom and Brexit,” Trump wrote. May last week decided to focus her energy on finding a compromise with the main opposition Labour Party that could help ease her deal through in time for Britain to leave without taking part in the European vote. Downing Street said the talks would continue at a “technical” level on Thursday after making little progress in initial rounds. May had previously ruled this out because it prevents her from fulfilling the promise of striking lucrative independent trade agreements with giants such a China and the United States. The talks have further outraged Conservatives and fuelled additional talk of attempts by her party’s right-wing to unseat her. May has promised to step down once she delivers the first stage of Brexit — a timeline that could keep her in power until near the end of the year. “But it is absolutely I think the case that there is growing discontent with her in her party,” said King’s College European politics professor Anand Menon. This entry was posted on 11 Apr 2019,01:04PM at 1:04 PM and is filed under mobile-leadstory, Business, News, Homepage Latest Stories Slider. You can follow any responses to this entry through the RSS 2.0 feed. Both comments and pings are currently closed.